I am going to present a co-author paper (with Shelly Knotts) at School of Creative Media, City University of Hong Kong as part of the conference “Art Machines: International Symposium on Computational Media Art “. Learning to code has started to be part of the core strategy in educational curriculum, from primary school to higher education, especially in many developed countries that promote stem education , or at least coding is recognized as an important aspect of science and technology development . In the art and design-related disciplines, creative coding emphasizes code as an expressive material , and embraces exploration and experimentation of code beyond functional applications. OpenFrameworks, Sonic Pi, p5.js Processing and ml5.js are some examples of open source platforms that facilitate creative and expressive creation through sharing and remixing code. In other words, the community of creative coding expands the usual way of learning to code beyond science and engineering disciplines. However, with the increasing demand of computational practices in emerging disciplines such as software studies, platform studies, new media studies and digital humanities, coding is increasingly considered as “literacy”  to humanities. This perspective of coding literacy becomes a critical tool to understand the history, culture and society alongside its technical level, especially regarding our digital experiences are ever more programmed, both technically and culturally. This presentation introduces two cases where two artist-coders consider code practice as a mode of aesthetic and critical inquiry, and they teach coding (in a format of workshop delivery) in a critical way through engaging with their artistic and coding practice. This aesthetic approach includes not only introducing coding practically and creatively but also cultivating an open space where discussing and reflecting on computational culture is possible. This is similar to scholar Michael Mates describes as ‘procedural literacy’, which is to connect social and cultural issues with coding through theoretical and aesthetic considerations. In particular, how “the culturally-embedded practices of human meaning-making and technically-mediated processes” are intertwined . By introducing two different hands-on code learning workshops, this presentation examines how aesthetic production or critical thinking can be cultivated and developed through learning to code. We suggest connecting code with social and cultural issues through performing, showcasing and discussing code-related art and performance as a departure point to develop code or procedural literacy. Without losing sight of exploring code technically and creatively, the two hands-on workshops illustrate how the suggested aesthetic coding approach could be realized in both epistemic and practical levels. The first workshop was conducted in 2017 titled ‘Feminist coding in p5.js | Can Software be Feminist?’ by Winnie Soon  and the second case was conducted in 2016 titled “Rewriting the Hack” by a live coder Shelly Knotts and curator Suzy O’Hara . We argue that the practice of aesthetic coding provides epistemic insights to explore computational culture beyond creative coding, shedding lights on how to work with code across disciplines and to consider coding practice as a means to think critically, aesthetically and computationally. Xie Yu, Michael Fang and Kimberlee Shauman, “STEM Education,” Annual review of sociology41, (2015): 331–357. Chung Bryan, Pong Lam & Soon Winnie, “Computer Programming Education and Creative Arts,” (paper based on a talk presented at ISEA, Hong Kong, 2016) ISEA2016 Conference Proceedings. Heaver Stuart, “STEM education key to Hong Kong’s ‘smart city’ plan, but long-terms steps must be taken now, experts warn (2017)”, South China Morning Post, accessed August 31, 2018, https://www.scmp.com/lifestyle/article/2124487/stem-education-key-hong-kongs-smart-city-plan-long-term-steps-must-be. Jing Meng, “China wants to bring artificial intelligence to its classrooms to boost its education system (2017)”, South China Morning Post, accessed August 31, 2018, https://www.scmp.com/tech/science-research/article/2115271/china-wants-bring-artificial-intelligence-its-classrooms-boost. Maeda John. Creative Code: Aesthetics + Computation (London: Thames & Hudson, 2004). Peppler Kylie & Kafai Yasmin, “Creative coding: Programming for personal expression,” (paper based on a talk presented at Rhodes, Greece, 2009). The 8th International Conference on Computer Supported Collaborative Learning 2, (2009): 76-78. Vee Annette, Coding Literacy: How Computer Programming Is Changing Writing (MIT Press, 2017). Mateas Michael, “Procedural Literacy: Educating the New Media Practitioner,” The Horizon. Special Issue. Future of Games, Simulations and Interactive Media in Learning Contexts 13(1), 2005. Soon Winnie. “A Report on the Feminist Coding Workshop in p5.js (2017).” Aesthetic Programming website. Accessed August 31, 2018. http://aestheticprogramming.siusoon.net/category/thoughts/. Knotts Shelly & O’Hara Suzy. “Rewriting the Hack (2015)”. Accessed August 31, 2018.http://rewritingthehack.github.io/index.html. The first Processing Community Day (PCD), organized by Taeyoon Choi and the Processing Foundation in 2017 was an effort to improve diversity within the art and programming community. For Processing Community Day 2019, it will broaden the reach and impact of this community by organizing with hundreds of Processing communities around the world. I am co-organizing a PCD day @ Aarhus onn 9 Feb 2019 with the theme called “How to think about code differently”, and we are aiming to build an open and local community to explore code and coding practice in many different ways beyond science and engineering specialisation and functional applications development. For the last six years I have been exploring the potential of live coding as an improvisational performance practice across contexts and genres. I’ve performed in the free improv, DIY and noise scenes, academic electronic music contexts and at Algoraves, collaborating with other live coders, acoustic musicians, visualists, authors, and algorithmic beings. Through the trial-and- (often fortuitous)error process of live algorithmic design I’ve expanded my own musical limits, learnt more about SuperCollider than I did in seven years in the studio and came to see live coding as more than just a tool for flexible improvisation. Through embracing live coding I came to perform technicality, becoming a visible example of a ‘woman who codes’. I became acutely aware of the narratives of live coding and the politics of embodying this position. I perceived the critique of feminine technicality that exists in music tech and computer science fields as amplified by the act of publicly ‘doing technical things’. Feminism as a performative practice became central to my work and resulted in projects such as ALGOBABEZ and OFFAL (Orchestra For Females And Laptops). In this workshop I’ll recount experiences from the wild of performing with and through algorithms, and expanding my own musical horizons through explorative coding. I’ll discuss embracing error and failure as part of the practice, using narratives around this to help diversify the live coding community, and the contribution of female live coders to reinserting women into the narratives of computing. After an introductory talk we will explore some live coding tools, techniques and practices and engage in critical discussion on performing with and through algorithms. In this talk Shelly will share observations from the wild of improvising with and through algorithms. She describes a number of performance systems which explore possible synergies between the dynamics of improvisation in music ensembles which use network technology to exchange musical and social data, and the dynamics of online social networking which is fundamentally mediated by algorithms and interface design. The pieces discuss and explore the dynamics of human interaction when data collection and algorithms are used to modify or moderate this interaction, and algorithms subvert or enable particular power-dynamics. This critical approach to algorithmically mediating improvised performance feeds into a live coding performance practice which acknowledges and highlights human error and failure. The talk will be followed by a performance of her work Flow (2015-16) which uses live EEG data to disrupt her live coding performance. 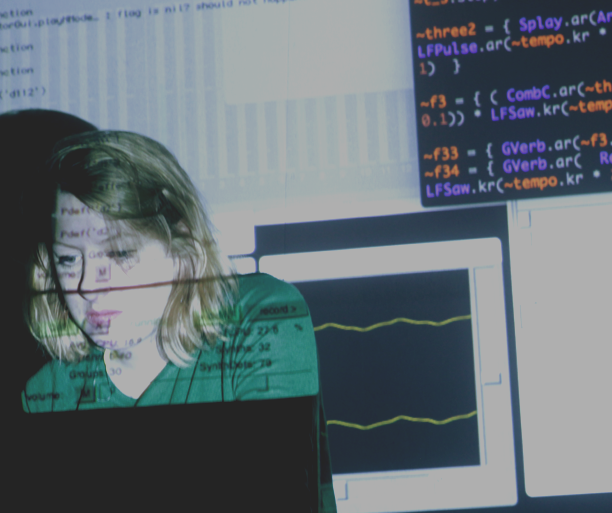 helly Knotts produces live-coded and network music performances and projects which explore aspects of code, data and collaboration in improvisation. She performs and presents her work internationally at festivals and conference, and collaborates prolifically with computers and other humans. She studied for a PhD in Live Computer Music at Durham University with a focus on the social dynamics of collaboration in Network Music. In 2017 she was Leverhulme Artist-in- Residence at School of Chemistry, Newcastle University, working on Molecular Soundscapes which included Chemical Algorave exploring live coded data sonification. She is currently a Research Fellow at SensiLab, Monash University working on ARC funded project Improvisational Interfaces. As well as performing at numerous Algoraves and Live Coding events, she collaborates with improvisers across a spectrum of styles and practices. Current projects include algo-pop duo ALGOBABEZ (with Joanne Armitage), international telematic laptop ensemble OFFAL (Orchestra For Females And Laptops), and audio-visual, generative live coding performance [Sisesta Pealkiri] with Alo Allik. She has received commissions and residencies from national funders in the UK. Her music has been released on Fractal Meat and Chordpunch record labels and in 2017 she was a winner of the inaugural The Oram Awards for innovation in sound and music. * The performative-lecture is supported by Humans and IT Research Centre, Department of Digital Design and Information Studies, and Digital Aesthetics Research Center at the Aarhus University, as well as Kunsthal Aarhus. As part of the Humans and IT research programme (HIT), Digital Aesthetics Research Center (DARC) has invited Allison Parrish, a programmer, poet and educator, to give a two days hands-on workshop regarding the state of the art of natural language processing, exploring the relationship between art, culture, creativity, programming practice, computational thinking and artificial intelligence. We will use Python as the main programming language, a high-level, interpreted and general-purpose dynamic programming language that focuses on code readability. Python can be run and used in multiple operating systems including Windows, Mac and Linux. No prior programming skills is required but you should be expected to get your hand dirty to tinker with code and use the command-line interface. The workshop will be relevant for those who are interested in textual/data/information analysis and creative computing across disciplines, such as software studies, digital humanities, STS, digital design, electronic literature, media studies, aesthetics and language studies, computer science and beyond. Fees: FREE but there is a limitation of max 15 participants. Priority will be given to faculty members and PhD students at Aarhus University and for those who can participate the two dates together. Natural Language Processing (or NLP) is an area that is a confluence of Artificial Intelligence and linguistics. It involves intelligent analysis of written language. In this hands-on workshop, we’ll investigate the state of the art of natural language processing with an eye toward using the sometimes-unintuitive abstractions of language produced by computational models to make programs that create surprising and poetic creative writing. Through a series of pre-written but easily modifiable programs, participants will be introduced to text analysis and language generation with the Python programming language. We’ll make automated “big Dada” cut-ups, undertake poor digital humanities based on word counts and part-of-speech tagging, and exploit vector arithmetic to write poetry like we’re using guitar pedals. Workshop participants will develop a number of small projects in text analysis and poetics using public domain texts of their choice. In becoming familiar with contemporary techniques for computational language analysis, information/data/literature/media studies, critics and researchers will be able to reason better about language-based media on the Internet. Designers, artists and writers, meanwhile, might just learn a few new techniques to add to their creative palette. Named “Best Maker of Poetry Bots” by the Village Voice in 2016, Allison’s computer-generated poetry has recently been published in Ninth Letter and Vetch. She is the author of “@Everyword: The Book” (Instar, 2015), which collects the output of her popular long-term automated writing project that tweeted every word in the English language. The word game “Rewordable,” designed by Allison in collaboration with Adam Simon and Tim Szetela, was published by Penguin Random House in August 2017 after a successful round of Kickstarter funding. Her first full-length book of computer-generated poetry, “Articulations,” was published by Counterpath in 2018. The open forum Learning to Teach, Teaching to Learn is originally initiated and organised by the School of Poetic Computation since 2016 in the United States. The event aims to bring together educators to explore pedagogy, curriculum development, and how to create environments and tools for learning computation and programming. At Aarhus University, programming has been introduced to both Bachelor and Master students in the areas of Digital Design and Information Studies, which is situated in the School of Communication and Culture. This mini open forum, Teaching to Learn and Learning to Teach, explores how computational thinking could be introduced beyond Computer Science and Engineering disciplines, and what are the challenges in teaching programming to arts and humanities? How might programming practice be considered as a mode of aesthetic and critical inquiry? How the production of creative works may help students to understand the essential components of computational thinking? As part of the Humans and IT research programme, Digital Aesthetics Research Center (DARC) has invited 6 speakers (and two, Prof. Nick Montfort and Anders Visti, are invited from outside AU) to respond to some of the questions above. Each presenter will share their teaching philosophy and challenges for 15 mins and will follow by a discussion. It is more an open forum for sharing and discussing various concerns in relation to computational thinking and programming practice. Anyone is more than welcome to join, especially for those who are interested in computational thinking, digital humanities, creative practices, programming and creative coding, etc. See more about previous activities on Teaching to Learn and Learning to Teach here. Nick Montfort studies creative computing and develops computational art and poetry. His computer-generated books of poetry include #!, the collaboration 2×6, Autopia, and The Truelist. Among his more than fifty digital projects are The Deletionist and Sea and Spar Between, both collaborations. His MIT Press books, collaborative and individual, are: The New Media Reader, Twisty Little Passages, Racing the Beam, 10 PRINT CHR$(205.5+RND(1)); : GOTO 10, and Exploratory Programming for the Arts and Humanities, and The Future. He is professor of digital media at MIT and lives in New York and Boston. Roman Rädle is a Postdoctoral Fellow in the Department of Digital Design and Information Studies at Aarhus University in Denmark. He holds a Ph.D. in computer science from the University of Konstanz in Germany. His research interests include human-computer interaction, ubiquitous computing, and programming education. He recently worked on the use of interactive notebooks in situations where the number of people and devices may vary over time, and how to support fluid transitions between these situations. For example, their use in educational settings where work using notebooks can change from individual work to collaborative group work and vice versa. Winnie Soon is an artist-researcher-coder-educator who resides in Hong Kong and Denmark. Her works explore themes/concepts around digital culture, including internet censorship, data circulation, image politics, code and real-time processing, etc. Winnie’s projects have been exhibited and presented internationally at museums, festivals, universities and conferences across Europe, Asia and America. Her current research focuses on Computational Thinking, working on a book with Geoff Cox titled “Aesthetic Programming: A Handbook of Software Studies, or Software Studies for Dummies”. She is Assistant Professor at Aarhus University. Thomas Hvid Spangsberg is a PhD- Fellow in the Department of Digital Design and Information Studies at Aarhus University. He is currently writing his dissertation which is due at the end of August this year. Thomas’ doctoral studies is about how to teach programming and computational thinking to non-STEM students. The main contribution is about a teaching methodology for introductory programming, which is based on natural language teaching and peer instruction. Thomas has taught introductory programming, interaction design and system development at Aarhus University since the spring of 2013 – right after earning his MSC in Digital Design. Anders Visti is a visual artist working with code. Founder and co-editor of the publishing house * [asterisk] from 2002-12. Founder and editor of the printed web publication ‡ DobbeltDagger and initiator of !=null, a public forum for artists, researchers, developers and hackers using contemporary technology for creative expression and aesthetic inquiry. Currently he is teaching basic coding skills and foundational computing at Funen Art Academy and Jutland Art Academy in Denmark. Together with Christian Ulrik Andersen, Marie-Luise Angerer, Geoff Cox, Jan Distelmeyer, Magda Tyzlik-Carver, and Søren Pold, I am going to join the panel discussion titled “what values?” as part of the transmediale workshop/festival in 2018 at Brandenburg Center for Media Studies – ZeM, Potsdam. I am going to give a talk at School of Creative Media, City University of Hong Kong as part of the course “Creative Media Colloquium”. In this talk, I will present some of my artistic works that span the areas of net art, software-based art, and electronic literature. My works examine the materiality of computational processes that underwrite our experiences and realities in digital culture that touch on cultural-social-political topics, such as Internet censorship, the economy of likes, spam and literary culture, politics of APIs, cultural machines and feminist software. I consider computational practice as a mode of humanistic inquiry to understand the digital culture – a condition that we are highly engaged with, and surrounded by, software and networked systems. I ask how might we understand cultural systems through computational practice? This talk will unfold the importance of computational practice in my thinking and research, examining the infrastructure and implications of cultural systems. Feminist Coding in p5.js | Can Software be Feminist? I am going to organize a half day feminist coding workshop primarily for women, queers, LGBT, non-binaries and minorities who are interested in programming, exploring the intersection of art, language, technology and feminism. The workshop addresses computer code as a language that is designed for both human and machine reading. Participants will base on the artwork/digital poetry/composition ‘Vocable Code’ to learn basic coding concepts, and they will also explore code as expressive and aesthetic materials, such as computer code as poetic text that is performative and executable. Through thinking and discussing code and (non)binary logics, participants will incorporate textual materials, visual effects and recorded voices to produce their own web-based algorithmic vocable code. – Bring your own laptop with Firefox Browser installed + your smartphone. Check !=null for latest update.